GoodReads Summary: One day David Small awoke from a supposedly harmless operation to discover that he had been transformed into a virtual mute. A vocal cord removed, his throat slashed and stitched together like a bloody boot, the fourteen-year-old boy had not been told that he had cancer and was expected to die. A silent movie masquerading as a book, Stitches renders a broken world suddenly seamless and beautiful again. 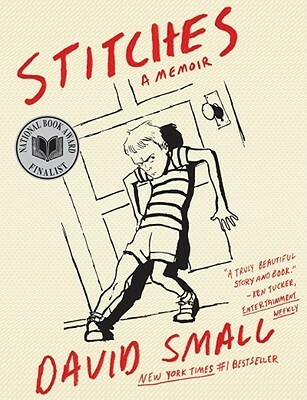 What Jen Thinks: I read Stitches before seeing David Small speak at the Anderson's Children's Literature Breakfast in February. After reading this book, I listened to him speak with a completely different perspective. I marveled at his ability to talk in the first place, and that he has become, what seems to me, a really nice man. It is amazing to think of all that he went through as a child. His drawings really brought his childhood to life for me. Only recently, after reading so many books, have I really started to visualize what is happening when I read a book. I know some people who are able to visualize everything clearly but for me it's doesn't come naturally. This book speaks to the power of a graphic novel to tell a story with the drawings. I will definitely use this with high school students to demonstrate how a format can be any genre. It still seems rare for a graphic novel to be nonfiction - even though I know there are plenty non-fiction graphic novels out there. This book seems much more poignant because it is an memoir that belongs to the illustrator and the story is so haunting. What Kellee Thinks: This is one of the hardest books I've ever read. I thought that a graphic novel about such a dark topic would be easier than a standard book, but I think it was actually the opposite. The illustrations added another level to the intensity of the story. It is a haunting novel dealing with resilience against abuse, cancer and insanity. Writing Prompts: Write about a time in your life when you felt frustrated with another person. How did you deal with the situation. Write about a time in your life when you felt overwhelmed.